The Miniature Poodle is an incredibly versatile dog. He will love whatever walks you can give him, and will make his own fun where he can. Traditionally the larger Poodles were used as water retrievers, and smaller Poodles to sniff out truffles. The smaller Poodles have a very similar attitude to their larger cousins, and were developed largely as circus dogs. The intelligence of Standard Poodles was legendary — but they were too big to work in the circus ring, so, a smaller version — the Miniature Poodle — with the same intelligence and trainability was developed. They immediately became popular, and, by the middle of the 20th century, they were the most popular companion dog of all time. Progressive retinal atrophy (PRA) is a disease of the eye, which causes the retina to degenerate slowly over time - vision slowly declines resulting in blindness. Prcd refers to a type of PRA, which is known in some breeds, including the Miniature Poodle. Cataracts are a painless clouding or coating of the lens of the eye. They most commonly occur as the dog ages, or as a result of injury to the eye. They appear as a milkiness of the pupil or aperture of the eye and tend to affect both eyes simultaneously. Once they are pronounced, the dog's eye may appear dilated as not enough light passes through the retina. Patella luxation is a condition where the dog's kneecap slides out of place, causing the leg to lock, with the foot held off the ground. It is common among small breeds and may be congential or caused by a blunt trauma. Perthes disease is where the blood supply to the femur bone in the hip joint is attacked, causing the bone to die, resulting in abnormal deformity of the ball of the hip joint. The breed is listed under the Kennel Club/ British Veterinary Association/ International Sheep Dog Society eye scheme. It is also recommended that parent dogs are given a DNA test for prcd-PRA. A breeder should be able to provide documentation proving that this has been done. It is advised that you do not buy from a breeder who can't do this. A clown by nature who loves to amuse his owners. The Miniature Poodle will love whatever walks you can give him, and will make his own fun where he can. He loves life and just wants to live it with you - he thrives on human company. The Miniature Poodle is extremely intelligent and loves to show off. He is quick to learn but needs to be given a good reason to do something. You need to be one step ahead so that he doesn't become bored. The Miniature Poodle thrives on affection. He has a profuse, dense coat that requires regular clipping, at least every six weeks. Show Minis tend to be clipped in the traditional lion trim, while companion dogs are likely to have the less flamboyant lamb trim. The coat is fast growing and can quickly become scruffy looking. His coat absorbs a lot of dust and dirt so he needs bathing regularly to avoid skin irritation. He also needs a good brush every few days to remove dead hair, otherwise painful mats will form. Coat requires regular grooming and trimming. There are three sizes of Poodle: Toy, Miniature, and Standard. It is a myth that the Poodle coat doesn't shed - it does, but rather than coming straight out it gets caught within the coat. Don't buy a Poodle believing that they are great for allergy sufferers. While they are less likely to aggravate some allergies they will still affect others - it depends on the allergy. 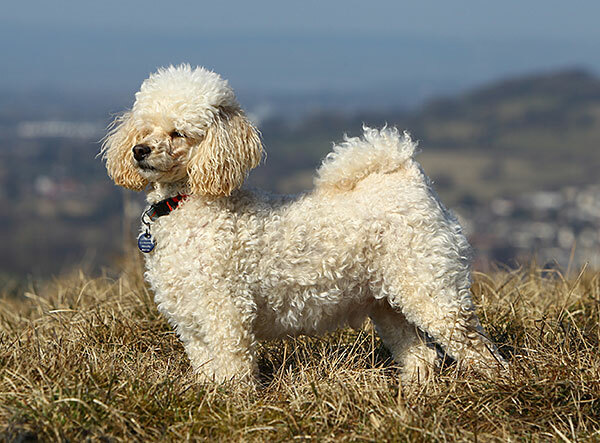 The Poodle's country of origin is listed as France, but it is believed that the breed actually entered France with German soldiers. Traditionally the larger Poodles were used as water retrievers, and smaller Poodles to sniff out truffles. Owners can often be heard saying the Poodle has cat-like character traits and mannerisms.